I recently had the pleasure of seeing the Orquesta Buena Vista Social Club perform at the Ravinia Festival, a beautiful theater just north of Chicago. 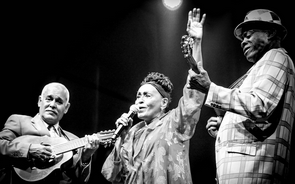 The band was inspired by The Buena Vista Social Club, a members-only club in Havana, Cuba that closed in the 1940s, as well as a band and film from the 1990s. The concert was the Chicago stop on the band’s farewell tour, and spirits among the Cuba-phile audience were especially high given that the U.S. had just raised its flag over the American Embassy in Cuba for the first time since 1961. I was seated in the pavilion area of the festival and enjoyed an extraordinary view of the stage. Unfortunately, the woman perched on the seat in front of me thought it necessary to film most of the show with her smartphone. Of course, she had to hold the device high enough to avoid the back of the head of the person in front of her, so her screen was squarely in my line of sight of the stage. After my annoyance faded, I became fascinated with the difference between my live (albeit obstructed) view and that through her camera lens. The amateur videographer was wildly texting snippets throughout the show, but I understood that her followers would never know the show I was witnessing. They couldn’t see, hear or feel the experience of the live performance. Why? Because they were viewing it through a different lens. An emotionally intelligent leader understands that she sees things one way, and her colleagues will often see it in a different way. They can be looking at the same thing, reviewing the same report, critiquing the same presentation, but it will always be through a different lens. Every person’s interpretation is created through a process that combines knowledge and experience (also sometimes casually referred to as intuition or gut-feel). No two combinations are alike so no two interpretations can be alike. It’s why we often disagree with co-founders, siblings, or life partners. Being emotionally intelligent is not being indecisive or soft. Rather, it’s understanding the context of differing views and measuring that against one’s own perspective. It is learned and managed through a process of conscious awareness and translation of another’s view followed by the understanding and empathizing of that view.